Texas public school teachers are heroes. They work hard for low pay, and with massive legislative budget cuts, spend significant personal dollars on their students’ school supplies. Teachers are the front line of care for Texas children. If a child has a learning issue or a problem in the home, teachers are the first to see and intercede at the risk of being blamed for it. On top of this, our Legislature loves to blame teachers for the mess lawmakers have created by underfunding public schools. 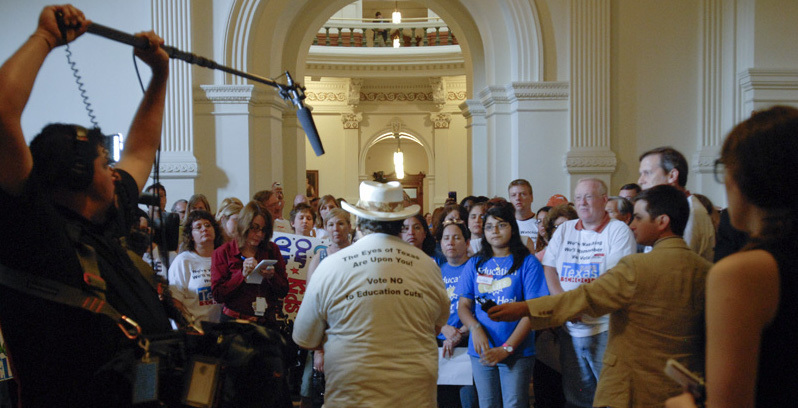 Pastors for Texas Children (PTC) are weary of legislators attacking teachers. Rather than adequately funding struggling schools (a small number of the state’s 8,500 public schools are struggling), state leaders fault teachers and propose schemes to privatize education that would enrich a few at the expense of many by draining even more funds from public schools. The Texas courts have repeatedly given the Texas Legislature an “F” for their inadequate support for Texas public schools. The Legislature has responded by creating a system to grade schools without reference to their own poor performance in providing resources for those schools. The latest legislative attack on teachers is Senate Bill 13, which removes teachers’ rights to have voluntary association dues automatically deducted from their paycheck. Teachers have enjoyed this right for more than 20 years at almost no cost to the state. Many Texans enjoy this right at work, including many Texas public employees. Our legislators enjoy this right. SB 13 would allow law enforcement, firefighters, and EMS workers to continue this right. SB 13 mainly targets teachers. Why make teacher’s lives harder by effectively weakening voluntary organizations that support them? The four teacher associations receiving these dues offer teachers a variety of important support services, one of which is representation in legislative actions affecting Texas teachers and children. In their repeated failed attempts to pass voucher schemes, some legislators have refused to hear that many Texans simply don’t want private education paid from public funds. Many groups have opposed their efforts as damaging to Texas children overall, including the teacher associations. But of all these opponents, these legislators are blaming the teachers and attacking them through SB 13. PTC has over 2,000 members, urban and rural clergy joined in supporting a strong system of public education for all Texas children, and the excellent professionals who make that system effective. We support the minor convenience of an automatic payroll deduction for these professionals to join an association that meets their needs and representing their interests. Furthermore, we note the discriminatory exemption of male-dominated state worker groups in SB 13 — firefighters and law enforcement — and the attack on female-dominated public services such as public educators. We thank God for all our public servants in the helping professions of Texas. Why would our legislative leaders want to pit one against another in this petty way? We also recognize the deeper negative effect of this bill on teachers in rural areas who may have greater difficulty securing support services if their teacher association is weakened. We hear the arguments in favor of SB 13 as a disingenuous cover for an anti-democratic attempt to punish and weaken teachers for opposing the greedy movement to privatize and profiteer public education in Texas to the detriment of Texas children. We see SB 13 as an attack on teachers’ voices through their associations. Legislators, “if it ain't broke, don't fix it!” Focus instead on supporting Texas public school teachers and our marvelous neighborhood and community public schools! Maybe this session, you can get earn a better grade in supporting the children of Texas by supporting a strong system of public education and the teachers who make it work. Heather Snow and Scott D. Ryan, University of Texas Arlington, Heather Snow is the Associate Vice President for Student Affairs and Scott D. Ryan is the Dean School of Social Work at University of Texas Arlington.